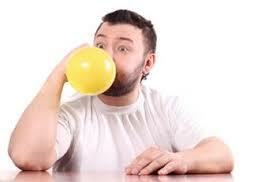 Although we know inhaling helium is not a healthy choice, most of us can say we have tried it. When you speak your first word after you inhale the helium, everyone in the room is hysterical. Why does your voice sound like this though? First, lets start with the air flow through your lungs without helium. When you talk, air travels from the lungs and up through the larynx where it meets the vocal cords. Infoldings from the mucus membrane stretch horizontally across the larynx, hit the underside and then vibrate. These vibrations determine, pitch, quality and frequency of your voice. Everyones voice is unique and there own way, but what confuses me is how does helium make everyones voice sound so similar? When you inhale the helium, you change the type of gas molecules in your throat and increase the speed of sound of your voice. Helium is changing the quality of sound in your voice, instead of the pitch or frequency of your voice. This results in that squeaky voice that we all find extremely hilarious. Since helium is considered a lighter gas, what would happen if we inhaled a deep gas like Sulfur Hexafluoride? Ultimately, your voice would do the exact opposite and slow the speed of sound resulting in deep grown mans voice. Now how can this affect your body? Well, when you are breathing in helium, you are not breathing in the correct amount of oxygen that your brain needs to function correctly. This may result in that dizzy light headed feeling, which means you should probably take a break. Frank Pegueros, executive director of DARE, Drug Abuse Resistance Education stated “it’s important to remind kids that ingesting any substance—for the sake of getting high or just changing their voices—can be dangerous”. This statement came shortly after one of few helium related deaths. Although this harmless gas brings many kids joy, you need to know when it is a good time or bad time for it. Matter fact, there really is no right time to inhale helium, but almost everyone will tell you that they have tried it at least once in their life. One thing people need to make sure they do not do is directly inhale the helium from one of the tanks, because that will rupture your lungs and result in a possible stroke, seizure or even death. This entry was posted in Uncategorized on December 2, 2014 by Justin Fernandez.